Flawes will be one of the first artists to embark on a series of intimate pop-up gigs in 20 university and city centre venues across the country as part of this year’s Coffee House Sessions tour. The two week promo tour revolves around stripped-back live sessions in popular student hangouts nationwide, offering artists the opportunity to engage directly with influential tastemakers on campuses across the UK, generating comprehensive media coverage across print, online, radio and TV. With each act bringing something new to the Coffee House Sessions circuit, fans of live music will be treated to weekly performances from a carefully curated line-up of incredible bands and artists from all over the world. The first half of 2017 has been an exciting one for Flawes who have already performed at a host of festivals including Live at Leeds, The Great Escape Festival, and BBC Radio 1’s Big Weekend. 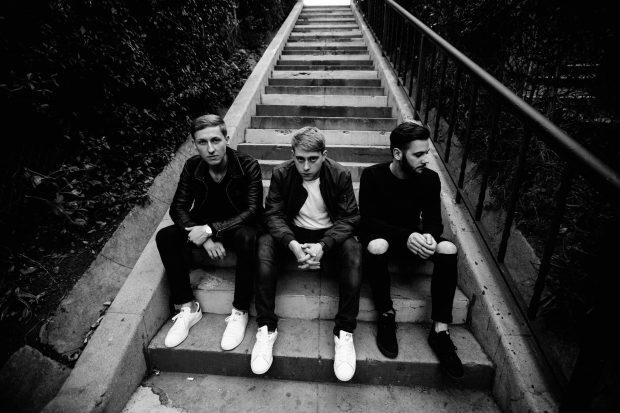 Flawes’ early career took off explosively when they broke onto the scene with their self-released debut single ‘Don’t Wait For Me’, which made it to #8 on the Spotify UK Viral Chart, and was playlisted on BBC Radio 1 amidst tastemaker support from the likes of Clash and The Line of Best Fit. The trio’s gift for dark, alt-electronica and huge soulful, pop choruses didn’t go unnoticed and Flawes are now signed to Red Bull Records worldwide. Now entering its fifth year, Coffee House Sessions is a unique platform for up-and-coming artists to showcase their music to dedicated audiences. Coffee House Sessions have played a pivotal part in shining a spotlight on new and emerging artists. Previous touring acts include Izzy Bizu, Tom Walker, Ady Suleiman, The Shires and Seafret.